Why do people watch sports? It's a loaded question. People watch for different reasons. But I know why I watch and I think I can figure out why a bunch of people watch. cable television history and the most viewers ever for a Sunday night NFL game. The Pats also also generated the biggest TV audience for a Sunday afternoon game in at least two decades and this week will be on two major TV networks for a simulcast game; the first time this blog can remember that ever happening. The reason for this is obvious: People want to see perfection, and, so far, the Patriots have been perfect. Most of us will never be perfect...in anything we do. We're human; more Homer Simpson than Peyton Manning. So in watching sports, we get to, in a frustratingly imperfect world, see perfection. Did you ever see Grant Hill play when he was young? Before injury and age robbed him. Robbed him of what God created...the perfect basketball player. If you missed him, here are some stats, though they don't do him justice. After the first six seasons of his career, before his ankle injury, Hill had a total of 9,393 points, 3,417 rebounds and 2,720 assists. Oscar Robertson and Larry Bird are the only two players in league history to eclipse these numbers after their first six seasons. And, as a point forward, he led the Pistons in rebounds, points and assists. For 4 straight years. Did you ever see Greg Maddux in his prime, when he had seven years in a row below a 3.00 ERA, two below a 2.00 ERA? When it seemed he had the ball on remote control, telling it where to go? Again, watching Maddux those years was watching art being created; watching Caravaggio or Renoir. Did you ever watch Bjorn Borg? How about Barry Sanders? 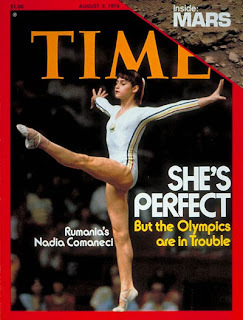 Nadia Comăneci? Lance Armstrong? Stockton to Malone? A young Mike Tyson before he got "confused?" And that's why people watch sports. Perfection is engrossing, because it's usually so unattainable. So people want to be a part of it. 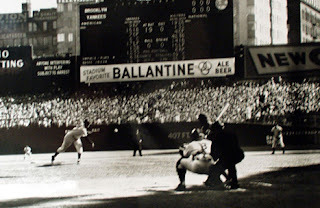 How many people claim to be at the Polo Grounds in 1951 when Bobby Thompson hit the most famous home run in baseball lore and created the most perfect moment in baseball? Nike had a commercial a few years back, showing people stopping whatever they were doing (the sink overflows with water, the bicycle outside was dropped at the curb) to watch Michael Jordan dunk a basketball. The point: the things we will do to watch a little bit of perfection. I am no exception. I can't paint the corners like Greg Maddux, just like I couldn't paint "Starry Night" like Van Gogh. I feel a swell of pride if I toast my Lender's with just the tips crunchy and the inside golden brown. And while I am proud of this blog, it is far from perfect. But for me, there's more to watching sports than just wanting to watch something perfect. More than watching someone dominate, like Michael Jordan, year after year. More than watching superhuman-type people do almost unimaginable things. Don Larsen had a career record of 30-39 when he took the mound, October 8th, 1956, game five of that year's World Series, against the Brooklyn Dodgers. A journeyman pitcher who would end up with a 81-91 career record, Larsen had just been shelled in game 2, lasting less than 2 innings giving up 6 runs. Even he admitted, he never thought manager Casey Stengel would put him out there to pitch again in the Series. On October 8th, 1956, however, he was perfect. He is the only person to ever pitch a perfect game in the World Series. Despite his career-long mediocrity, despite the lack of dominating God-Given talent, despite all his human-ness and flaws, he did something no one has ever done before or since. Not Roger Clemens, Sandy Koufax or Cy Young. For one day of his flawed life, he was perfect. And that is why I watch sports. Because I'm imperfect. Because I'm average. And because I hope that one day, even a very flawed person like me, could be perfect at something, just for a little while. I hope, someday, me too. I agree with P-Cat, but I'll be less diplomatic. The infatuation with pefection describes the casual fan, or even the non-fan. How much different is it from slowing down to gawk at an accident on the highway? Its our culture's obsession with celebrity and the big news story. However, the die-hard sports fan's interest runs deeper. I wonder how long-time Patriots fans feel right now? I think they feel the same way I did when I was enjoying the Yankees run in the late 90's. I have always been a Yankees fan, and unwaveringly sufferred through the 80's and early 90's. Win or lose, the Yanks are my team. I was irritated by the frontrunner fans and fair-weather fans. Not having been there during the darker years, I felt they had less of a claim on the Yankees success than I did. A true fan is there when their team is at its most imperfect, as well as perfect. P-Cat zeroes in on that with the Don Larsen example. What's fantastic about sports is its unpredictability. How many times have we heard "On Any Given Sunday"? In baseball, who could have predicted so many wild card teams would win the World Series? Sports is competitive, unscripted, and unpredictable in a way that all the stupid reality tv shows can't be. Which gets to the heart of why "true" fans watch sports. Its not tuning in for Pats-Giants when we know we have a reasonable chance of seeing history made, but for games like Don Larsen's- the unexpected triumph. The upset. These wonderful joys come from watching every game, good or bad, win or lose. Thanks R-Nav. You say it quote well. Fair weather fans do irritate me (I think of all the "new" Met fans in 1986 who, I haven't heard from lately. But the "Any Given Sunday" factor is the true beauty of sports. The Villanova over Georgetown, the Jets over the Colts in 1969. And some journeyman named Larsen who made baseball history. Thanks for the good comment, R-Nav. So now the "regular" season is over. For me, as one of those long-time Patriots fans R-Nav mentioned, there was nothing "regular" about it. I tuned in to every game I could because I wanted to see history unfold before my eyes. I wanted to witness that. I was one of those fans who ached through the decades of mediocrity watching the Pats in the 70s, 80s, and 90s. Wearing my Steve Grogan jersey, I watched the team struggle toward their elusive goal of respectability. Even my mother got in on the campaign making foot-shaped chocolate lollipops and selling them to the neighborhood. She called it "Franklin's Foot", and it was of course a tribute to the Pats barefoot kicker, Tony Franklin. So I understand what it's like to keep the faith through the tough years. Even the 1985 season, which gave us something to be excited about, had with it a dark, ominous feeling. We made it to the Super Bowl, yes. But somehow we knew that it wasn't going to end well. We went to the Big Dance with the Chicago Bears the same way the high school football captain asks the nerdy girl to the prom, only to say, "Just kidding" for fun. For decades, we were the wimpy kid on the block everyone pushed around. The Dolphins regularly stole our lunch money, and like the Red Sox since 1918, we just never expected to get the glory we dreamed about. We grew to accept that. As a fan, I don't look for perfection. That's not what draws me in. For me it's competition. Watching two teams who already have their playoff seeding set go on the field and give it everything they've got is what it's all about. That's what charges me up. My hat is off to Tom Coughlin who was able to motivate his team to do the job they did on Saturday. He could have sat his starters to rest up before their playoff game in Tampa next week. But he didn't. He realized that he owed something to America in giving it his best shot. I applaud the New York Football Giants for displaying toughness and grit that - even in a loss - impressed everyone. So much of America tuned in to watch this game on Saturday because it was a rarity. It had the potential to be a historic game. People like to be a part of history and tell their kids, "I remember watching when...". What the Patriots did this week was RARE, but it wasn't PERFECT. There were dropped balls, misread defenses, and uncharacteristically unsportsmanlike conduct. The Patriots are the better team. We all knew that. But the Giants played a better game. If the Giants play in January like they did on Saturday, they'll have success. On the other hand, if the Pats play that way against playoff teams (like the Giants), they may be looking at 16-1. I don't want to sound like a negative fan, but while I appreciate what the Pats have accomplished (so far), I can't blindly say they're perfect. They're didn't show me that on Saturday. They should have won by 30. They won by 3. They went 16-0 in the "regular" season, but you're not undefeated until you win the Super Bowl. If they do that, they will have accomplished more that the '72 Dolphins. If not, Shula's team still did more than Belichick's. Thanks, Cajetan for your comments. I understand what you mean by fair-weather fans. I feel that way sometimes with the Yankees. But at this point, being a Jet fan, we don't have that problem. I could be wrong....but probably not.